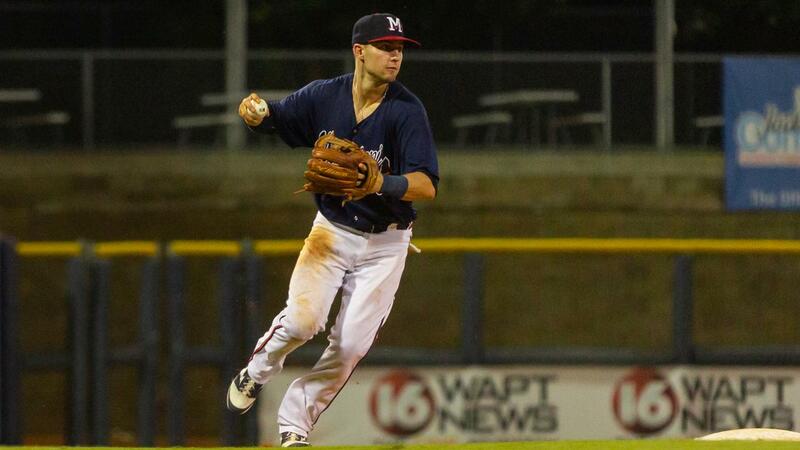 PEARL, MS -- The Biloxi Shuckers took back over first place from the Mississippi Braves in the Southern League South Division with a 7-1 victory on Monday night at Trustmark Park. In the process, the Shuckers stopped Mississippi's five-game winning streak at home and four-game winning streak overall. Biloxi now leads the M-Braves by a half-game with one game left in the series at noon on Tuesday and seven games left for the Braves in the regular season. Pensacola is tied with the Braves, also a half-game back. Ricardo Sanchez (L, 2-5) took the baseball for the M-Braves on Monday night at Trustmark Park and tossed three shutout innings before giving up a run in the fourth on a homer by Brewers top prospect Keston Hiura. The home run tied the game at 1-1 after the M-Braves (34-27, 63-68) took the lead in the bottom of the third inning on a passed ball. Daniel Lockhart started the frame with a double and moved to third on a single from Ray-Patrick Didder . Lockhart sprinted home on a fastball that sailed off the glove of Biloxi catcher Max McDowell. Biloxi (36-28, 77-57) took the lead in the top of the fourth inning for the first time since game two on an RBI double from Corey Ray. Another came across on an error to make it 3-1. Ray and Hiura, the top two prospects for the Brewers, were a combined 1-for-19 in the series entering Monday's game but finished the night 4-for-10. Sanchez ended his night by giving up three runs (two earned) on six hits over 5.0 innings with one walk and one strikeout. The 21-year-old lefty has yielded just three earned runs over his last three starts and 17 innings on the mount. Josh Graham followed Sanchez and pitched 2.0 shutout innings to keep the score at 3-1 after seven innings. The Shuckers added two more runs in the eighth inning and two in the ninth against reliever Justin Kelly to push the lead to 7-1. Biloxi starter Trey Supak (W, 5-6) earned win by giving up just one unearned run on three hits over 6.0 innings. Lockhart scored Mississippi's lone run and finished 1-for-3 with a double. Tuesday's noon start will be the 24th and final meeting between the clubs, with the Shuckers leading the season series 12-11. The all-time series stands at 44-44 after 88 meetings in four seasons. RHP Enderson Franco (5-9, 4.18) will get the ball for the M-Braves in the home finale against a to be determined starter for Biloxi. The M-Braves are 36-32 this season at Trustmark Park. On Tuesday, fans can exchange a Polk's Meat Products label at the Trustmark Park Box Office for two tickets for the price of one, excluding Suite Level and Club Level seats. All hot dogs and 16 oz. soft drinks will also be two for the price one. The promotion is presented By Polk's Meat Products & WJTV 12 Getting You Answers. Coverage will begin at 11:50 am on 103.0 WYAB, TuneIn Radio and MiLB.TV. For more information, call the M-Braves Front Office at 601.932.8788 or 888-BRAVES4, or visit www.mississippibraves.com. Individual tickets start at just $6!